Energy efficiency is claimed by almost all heating manufacturers but there usually is little hard information to back up the claim. Of course, actually measuring heating consumption in a residence and providing comparative data is a challenging endeavor. To overcome this issue, our analysis has taken a different approach and one that is backed up with real numbers. We took available industry figures, academic studies of real world scenarios, data on various heating technologies and their known performance characteristics and have conducted an analytical comparison of the efficiency and cost of all major heating technologies. 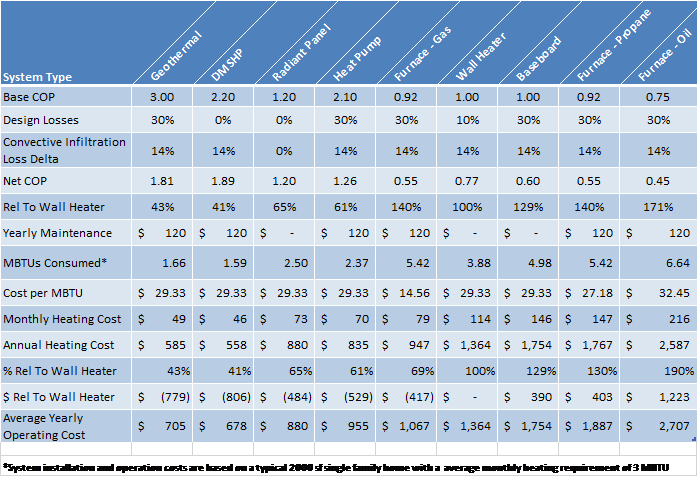 The results of this analysis conclude that Infrared Radiant Heating Ceiling panels and Ductless Mini-Split Heat Pumps are the two most cost effective heating systems, inclusive of operating, maintenance, and replacement costs. Over the lifetime of a typical home, Radiant Ceiling Panels are the least expensive system for home heating, costing 10% less than Ductless Heat Pumps, 30% less than Cadet-type Wall Heaters, and 50% less than baseboard heaters. Our analysis starts with the base Coefficient of Performance for each heating system, adjusted for design losses due to non-zonal control, ducting losses, excessive thermal gradient requirements, and envelope loss differential between radiant and non-radiant systems. 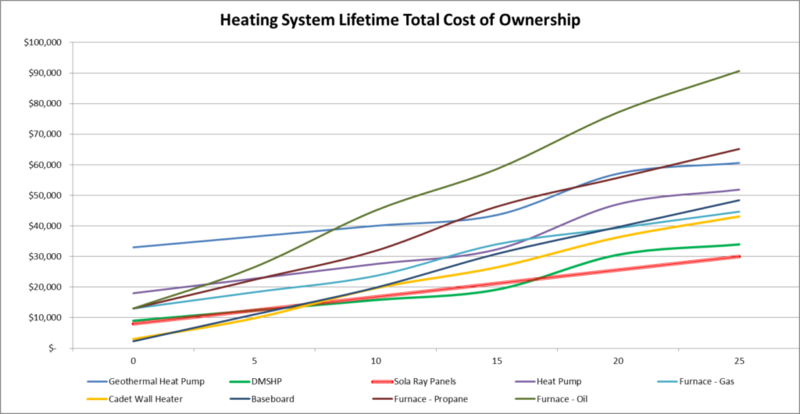 This adjusted COP or efficiency factor combined with the relative fuel costs for each different heating system, yields the operating cost comparison of each system. Based on this analysis, here is the Total Cost of Ownership from initial installation through 25 years. The Total Cost of Ownership includes initial installation cost, annual maintenance and operating costs, and replacement costs. The replacement costs are critical as all of the heating systems other than Infrared Radiant Panels require at least one replacement over the 25 year period and that cost is substantial. Even ductless heat pumps, one of the most efficient and least expensive heating systems have a greater TCO after 20 years due to system replacement costs.